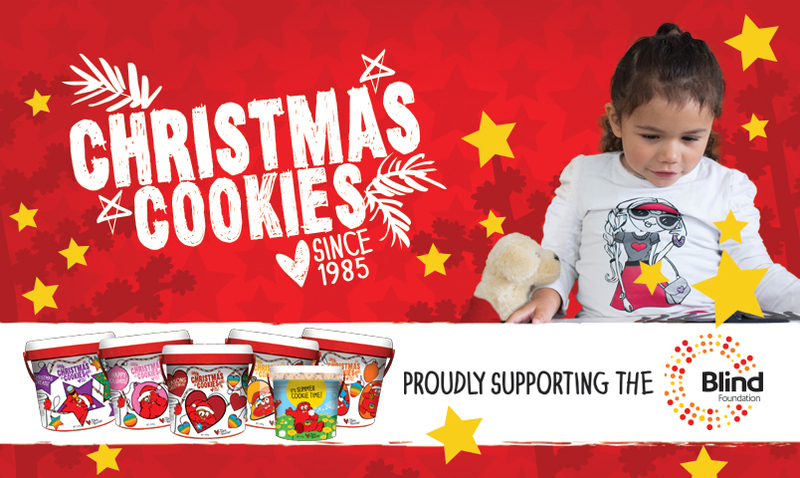 The Blind Foundation is excited to have been selected as Cookie Time Charitable Trust’s hero charity for this year’s Christmas Cookies campaign. A donation from cookie sales will go towards supporting services such as the Blind Foundation Library, guide dogs, adaptive technology, children and youth support. Overall, Cookie Time is on a mission to raise $250,000 for charity from Christmas Cookies sales, so if you needed an excuse to eat more cookies this Christmas, here is your chance! Keep an eye out for Christmas Cookies sellers who are out and about in your community, or visit the Cookie Time website and request a seller to come to you. There are five delicious flavours to choose from – new Peanut Butter Chocolate Chip, Salted Caramel, Cranberry White Chocolate, Apricot Chocolate, and the classic Chocolate Chip. Each 600g bucket costs $16 and contains roughly 85 bite-size cookies. There are also 275g mini buckets of Gluten Free Chocolate Chip cookies available for $15 each. These buckets make great gifts, or keep them for yourself to snack on over the festive season. Find out more about the Cookie Time Charitable Trust and their initiatives over at ctct.org.nz.